Let me first say wow!! The energy in Paris was absolutely unbelievable Saturday night, I have never seen Paris like this before. There was singing, dancing, drumming and laughter everywhere in the streets. Every year in all of France, Fête de la Musique celebrates the first day of summer (summer solstice) and of course music. I have been looking forward to this day for YEARS. After first hearing about it in the film 2 days in Paris, I became curious about this day. Singers and musicians performed every single type of music under the sun; both professional and not. There were many famous french artists giving free concerts, as well as a free Lana Del Rey concert I found out about too late -wah! I really liked the Hip hop group: Le Quartier Libre I may try to catch a show! There were also DJs playing on the streets; everything from top 40, mash-ups, dub step, and house music. Mini raves would form around them! We also came across a DJ playing salsa and a big group of people salsa dancing. Good dancers or not people were not shy and that was awesome. I asked Pierre if he would dance with me and he of course looked at me like I was crazy. So, I just filmed and admired. I guess my look of longing to dance was evident because an older man came up to me and offered me is hand. I got shy and said "no merci". Of course regretting it now, next time I WILL salsa! I didn't realize how starved I was for music and dancing until that night. I think I've found my new favorite day! Paris is truly dedicated to the arts! I was pleasantly surprised to see that Gare de L'Est has a lovely piano in the waiting/ seating area of the train station, ready to be played by anyone. 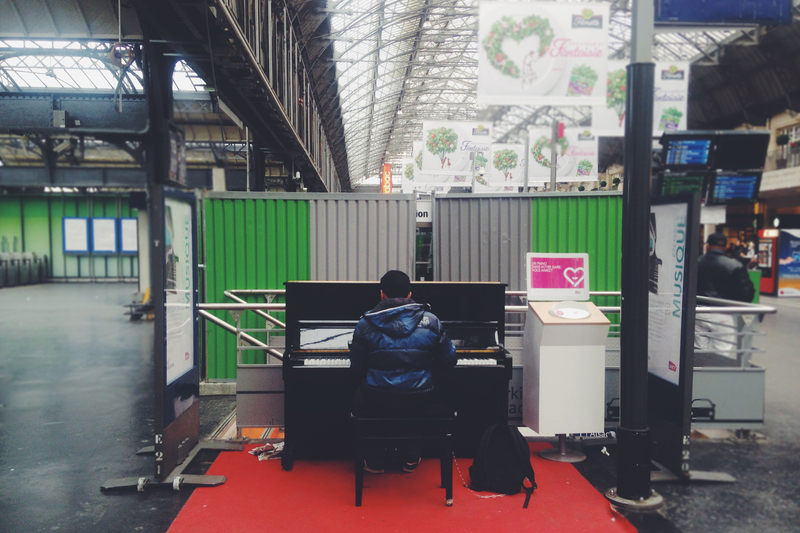 These pianos can be found throughout various train stations. This guy was pretty good. He was playing Hey Soul Sister by Train, how fitting haha!